Heat ½ tbsp oil in a frying pan. Fry the breadcrumbs and half the chorizo for 2-3 minutes until crispy. Remove and keep warm. Heat the remaining oil in the frying pan, and fry the chicken and potatoes for 2-3 minutes. 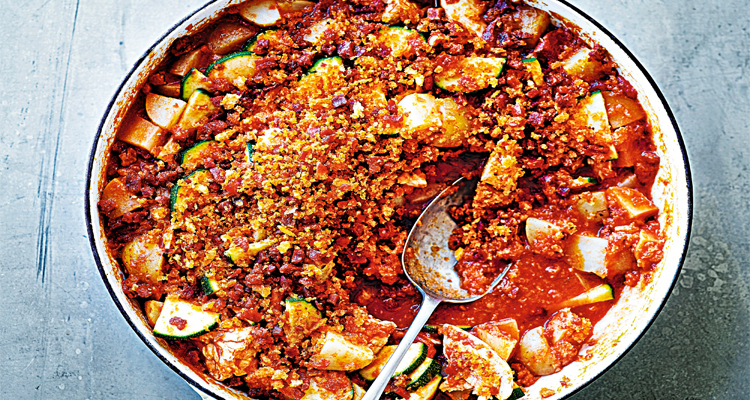 Add the rest of the chorizo crumb and cook for a further 3 minutes. Stir in the tomatoes and 100ml water, cover and simmer for 10 minutes. Add the courgettes and cook for a further 5 minutes, until the chicken is thoroughly cooked with no pink meat. Sprinkle over the reserved crumb mix to serve.